Clara has returned to her village in the Swiss Alps after her summer holiday. 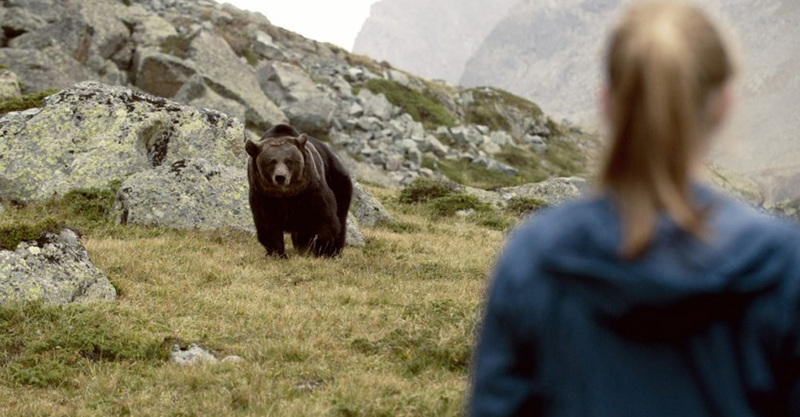 She sees a bear cub playing in a meadow and suspects the father is not far away – the mother was killed by poachers the year before. Clara starts to have visions brought on by the house her step-father is renovating; visions of a young girl from the past and her troubles. It becomes clear that Clara must find a way to help this girl and the bears. I get very nervous about bears. I think that’s quite natural. They are wild and have claws and teeth and kill people. I found some of the scenes with Clara interacting with the bears, even from a distance, very unsettling, even though there was no real indication that anyone would be hurt. It was not that type of film. It is, however, a gorgeous film. The alps are so beautiful, the story is strong and you are quickly on the side of Clara, who is quite strong and capable, yet a bit out of her depth. I felt, at times, that the editing took away from the story, possibly missing some crucial points and dwelling on things that had been clearly stated, but it is none-the-less a film worth watching, and a film I think many younger teenagers would enjoy.